Beautiful, 2BR/2BA Villa... 100 Yards from the Atlantic Ocean! 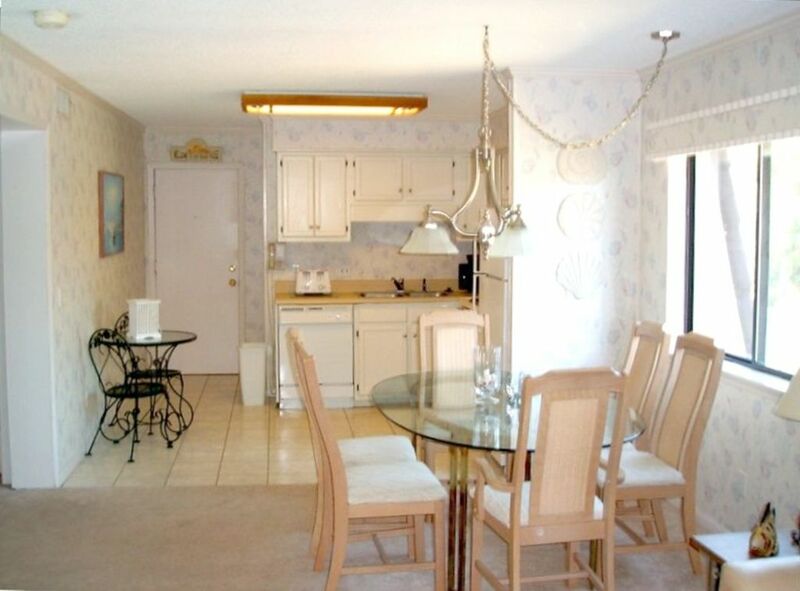 Our two bedroom, two bathroom, Non-Smoking, villa condo is located in Hilton Head Beach and Tennis Resort. Hilton Head Beach and Tennis Resort is a gated community located mid-island on one of the widest and most beautiful beaches on the Island. Hilton Beach and Tennis Resort has many amenities to accommodate almost all guests' wants and needs such as: an indoor boardwalk with a bar and restaurant, video rentals, and a convenient store. Bike and roller blade rentals are available to use on the many paved bike trails around the island. The resort has many lighted tennis courts, a tennis pro-shop, playground for the children, basketball courts, and charcoal grills at the picnic areas. This condo is just 100 yards from the children's pool and the largest pool on the island which overlooks the beach and ocean. Poolside you will find many arts and crafts scheduled for the children, a restaurant, a tiki bar, live music, snow-cone shack, and shuffleboard all available in season. The beach has umbrella, beach bike, and catamaran rentals all available. There is also sand volleyball on the beach. The villa has two bedrooms, two bathrooms, full kitchen, living room, dining room, and a balcony. This condo comes fully furnished including dishes, pots, coffee maker, microwave, color TV, VCR, DVD, sheets, towels, etc... All for your convenience and comfort! I have been going to Hilton Head for 40 years and have never stayed at a condo as dirty as this one. The table had something so sticky all over it that whatever you put on it would stick. The linen did not appear to have been changed from the last guest. When you walked in the bathroom and kitchen, the floors appeared to have been cleaned with dirty water. Your feet would stick. We had to buy cleaning materials before we could settle in. Plus one of our children was bitten by a spider. His arm swelled up and had a big white head surrounded by a red circle. He was bitten in the closet where the beach toys were. Needless to say none of us went back in that closet. I used to have rental property at HH myself and I can assure you I would never have rented my place without it being thoroughly cleaned. This is a disappointment to see this review. We have been renting our property for 10 years and have only had 5 star reviews. We have many families that come back every year and rent our villa. Some have been renting for 5 or more years. This family could have contacted me immediately upon entering the property and we would have had the cleaning company come to reclean. I find it very disturbing they would sleep on dirty sheets. If I was renting the property I would be contacting the owner ASAP. I would expect to be contacted and I would take that up with our service. I was not contacted at all about anything she is speaking of until I was called by my cleaning company after they checked out on 8/11/18 of the condition she and her family left the property in. I emailed her about the pictures I received showing vomit on the carpet, trash everywhere, a broken dining chair and filth. It’s unfortunate the child was bit by a spider. We have the property sprayed monthly for insects. It’s upsetting to think they think I can control such a situation. I hope all our renters would contact us immediately if they had any issues. We are more than happy to rectify them. Very Nice location, excellent hosts. This was our 2nd winter month stay at this condo. The owners are excellent and had made some recent improvements to their unit. We would stay again. The HHIB&T complex itself seems to be doing a good job with exterior repairs, painting and some upgrades. Easy access to beach and this condo sits right next to the Tennis courts. My wife and I stayed at Rich and Sue's place for a month. It was our first time in Hilton Head. The villa was perfect for us. It was clean and comfortable and well stocked. The bed was very comfortable. We had friends join us for Thanksgiving week and there was plenty of room for all of us. The resort itself was very quiet. The weight room and laundry facility were fine. In Hilton Head everything you might need is close by. The resort is right on the beach and it was absolutely spectacular for beach walking. The dolphins were sighted almost every day! The golf was also wonderful with many options very close by. Rich and Sue were very accommodating with some last minute changes by us. We appreciated that. I highly recommend this place and I'm sure we will be back. We loved every minute of our stay! The owners, Sue & Rich were great to deal with, easy to contact and everything went better than expected. We plan to stay again. This was our first time staying at Beach and Tennis. We traveled with 3 other families who each had their own condo in the resort. Our unit was spacious, the extra window on the side wall added extra light and an open feel to our unit. The owners were easy to work with and very responsive. Due to a tropical storm, we spent one day indoors but the condo was perfect for staying dry, relaxing, watching TV, reading a book and playing cards and games with the kids. Honestly, it was one of our favorite days! One evening, all 17 family members met in the resort's picnic area for a grill out and we had a fabulous time eating all together without the wait of a restaurant on the island. The pool is HUGE and our condo had everything we needed for the beach including beach chairs. We are already interested in booking this same condo for next summer. We had a lovely experience. Our first trip to Hilton Head was a complete success. Thanks Rich and Sue for offering the use of your condo. It worked out perfectly. The condo was clean, spacious, and well equipped. We had everything we needed and more. The location and landscaping at HHI Beach and Tennis Resort was absolutely beautiful. The ocean front pool was gorgeous and the poolside bar and restaurant was convenient and delicious. Since we travelled before Memorial Day, we didn't have much problem with traffic and found plenty of restaurants that didn't require long waits. There is plenty on the island to explore - Coligny Square is fun and Harbor Town is beautiful. But we did enjoy the serenity of HHI Beach and Tennis Resort. I highly recommend it and your condo! Rates may change until confirmed. Contact the owner for monthly rates.